Original Poems for Infant Minds by Ann Taylor Gilbert (1782-1866). 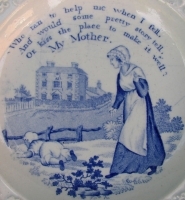 A child's plate printed with the title My Mother. It reads; "Who ran to help me when I fell, And would some pretty story tell, Or kiss the place to make it well; My Mother." The poem is from Original Poems for Infant Minds by Ann Taylor Gilbert (1782-1866).